As a kid growing up in India we ate seasonally. There was no other way. Cauliflower, Carrots, Green Peas and Beets only in Winter. For a short period, maybe November to late February. By March, the carrots in the haat were shriveled old things, the cauliflowers absent and nary a green pea could be found spilling the bean. The most that we missed once winter wrapped itself up in a Pashmina and traveled further North were the Tomatoes and green, leafy coriander. Ma, made bottles and bottles of Tomato ketchup which we hung on to until April or even May and after that dearly missed the maacher jhol with tomatoes and generous garnish of coriander which was a winter staple. Not a speck of green coriander leaf or a squishy red tomato could be found once summer set in. Later, even in the early nineties, the bunches of coriander that were sold post-Winter were sad, raggedy bunches that clearly wanted to join their sibling in a colder climate. Summer always meant green vegetables with more water content and fruits brimming with juice. 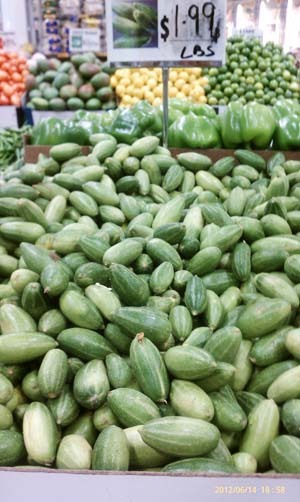 Jhinge or ridgegourd with raised thick skin, Pointed Gourd or Potol with its deep green stripes, and pale green Lau or BottleGourd were the standard. The tender potol in the early days of summer had a glamorous life. They were pounced upon to be made into stuffed dormas, fried to grace a cholar dal or steamed with coconut and mustard in a paturi. But as they say a life of fame does not last forever. As summer progressed it was the mango which stole the show while potol and jhinge were forced to lead a sad backstage life featuring in every B-grade home cooked movie and being berated by home cooks. Just as the populace in the gangetic plains waited for the monsoon, for the summer to be over, they also craved for more color in their menu. For that though they had to wait. For Winter. 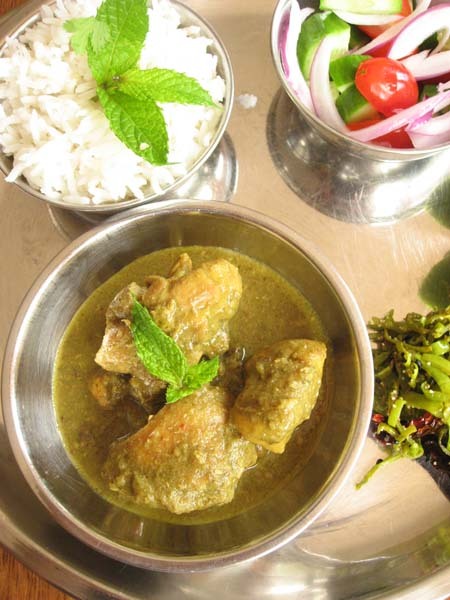 Thus there was a clear demarcation of Summer and Winter Menu with some overlap and rarities thrown in Spring when Drumsticks and copper colored baby neem leaves made a brief appearance. Now as we all know it is not so. Six pack tomatoes, shiny and un-squishable lead a comfortable life all through out the year. Green, striped Potols stay put and no one's heart misses a beat on their first day, first show appearance. Here in the US though, the Indian grocer gets his Potol only in Summer. Good for me. I feel privileged to eat overpriced potol, a couple of times a year. The mundane is uplifted to the precious and I blog of alu potol diye maacher jhol which makes me go all mushy and tearful just like the tomato-dhone pata diye maacher jhol did with the first batch of deep red tomato. Did you eat seasonally while growing up ? How did your menu change from summer solstice to winter ? 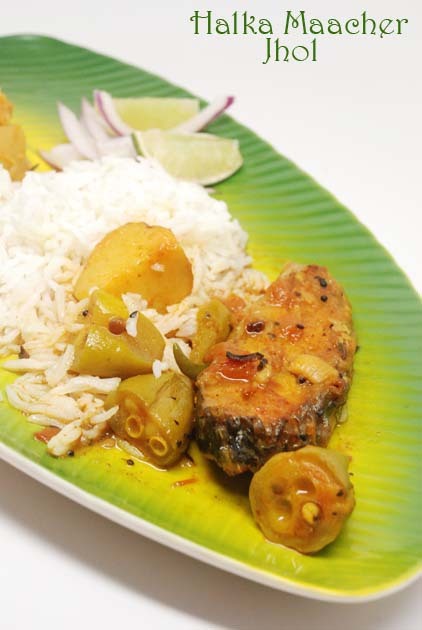 This alu -potol diye maacher jhol is a soupy, runny gravy of fish and vegetables. Suited best for hot summer afternoons it is a delight when mixed with rice and a squeeze of lime. It is also my Ma-in-law's recipe as proffered by the husband. Unlike me, I think he hung around in the kitchen while his Mother cooked. He rattles off recipes without picking up a single phone to anywhere. And said that his Ma puts a little bit of onion in this jhol. Now,in my home a jhol will not have onion while a dalna might but this one does and it is from a Bengali home so you see when it comes to a dish there is nothing written in stone. If you do not like Potol or do not get it you can make this same jhol with cauliflower and it will taste as good. Wash and clean fish pieces. The favored fish is Rui/Rohu. I have used fresh Tilapia. Rub with turmeric and salt. Keep aside for 20-30 minutes. Heat 2 -3 tbsp of Mustard Oil and shallow fry the fish till it is golden brown on both sides. Remove and keep aside.The health freaks can broil in the oven. It works. Let the spices infuse the oil. To avoid the spices getting burnt I often switch off heat at this point and let the spices mingle in the oil. Switch back the heat and to the oil now add 1 tbsp of minced onion and fry with half a tsp of sugar. Once the onion has browned add 1 tomato finely chopped and 1 tbsp of fresh grated ginger. Fry the masala with sprinkle of water for next 3-4 minutes till you see oil seeping from the edges. Add the potatoes and potol that you had fried and kept aside. Mix well with masala. Next add water for the gravy. Since this dish has a lighter gravy I usually add about 3 cups of warm water. Add salt to taste. Let the gravy simmer and come to a boil. Once the potatoes and potol are cooked add the fish pieces. Lower the heat and simmer for 4-5 more minutes. Serve with rice and a slice of lime on the side. A few years back I did not know about a "Bhorta" with an "O". The only kind I knew was "Bharta" with an "A" and that began and ended with "Baingan Bharta". And then came LS's babysitter from Bangladesh and we kept hearing a lot of "Bhorta". However we didn't get to eat many except "Aloo Bhorta" which is almost like "Alu-Sheddho" and a "Alu-Sheem Bhorta" which again is almost like a sheem bhaate. LS's babysitter is not too interested in cooking and so that is that. But at least now we were more aware and didn't say "Baingan" when someone said "Bhorta". 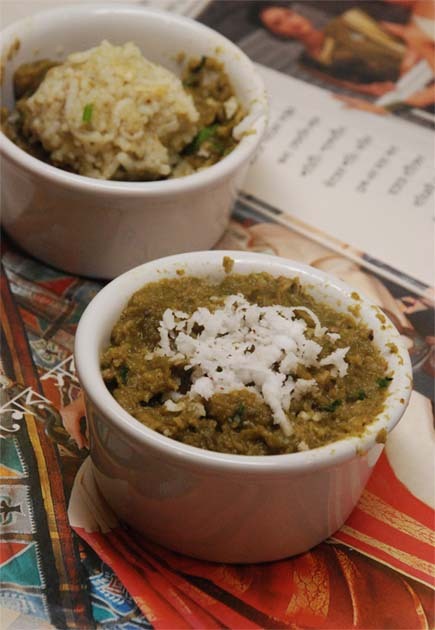 Bhorta is a dish where veggies, fish or even meat are mashed and spiced. 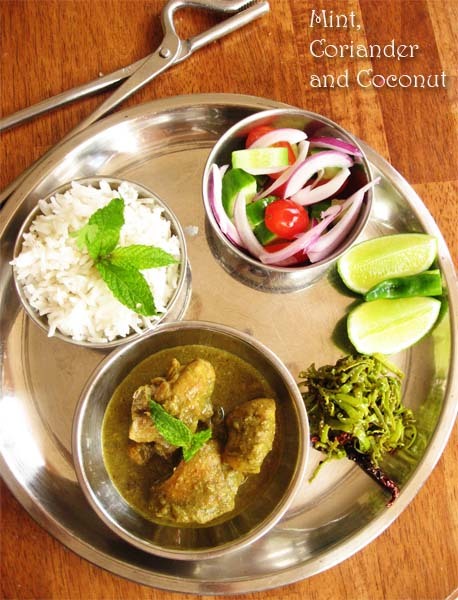 It is the signature of Bangladeshi Cuisine holding a place above any other food in their culinary culture. 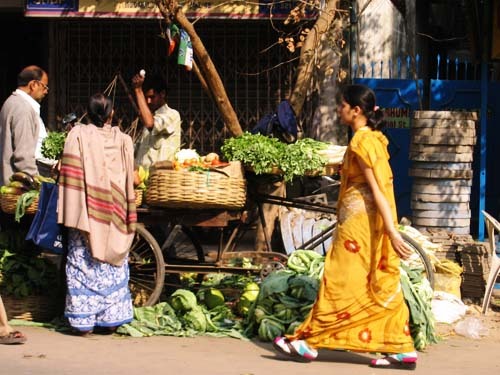 Amazingly, it has not trickled into mainstream Bengali food in neighboring India and most Bengalis from India are unaware of the myriad of bhortas that Bangladesh boasts of. Then last year came the husband's sis, the sis-in-law, a very enterprising and good cook. And guess what, she befriended a neighbor who was from Bangladesh and a storehouse of all kind of "Bhorta". My sis-in-law did not waste time and honed her skills on numerous "Bhortas" and when she visited us last year, she brought along a tupperware full of greenish hued "Bean Bhorta". not "Spring" Bean silly -- it is "String"
Now I am not too fond of "String Beans" or "French Beans" and usually avert my eyes and look the other way towards the mint and the coriander when I am confronted by them. But this was different. This was "Whoa" good. Very good in total un-beanly way. I mean if you are a green bean fan you might not like the idea of pulverizing the whole thing into bean debris but believe me even then you are going to like it. My sis-in-law adds chingri bata or roughly ground shrimp to this. I wanted a veggie version and she suggested grated coconut. So I used the frozen grated coconut of course. This is a rough recipe with the measures eyeballed. Go with your instinct. LS's babysitter said "Bhorta" should be green chili hot and so we added a good quantity of green chili. Frankly it was too hot for me. But the way you eat it , mixing a small portion of bhorta with white rice attenuates the heat and makes it pleasantly bearable. In that sense, a little bhorta goes a long way. 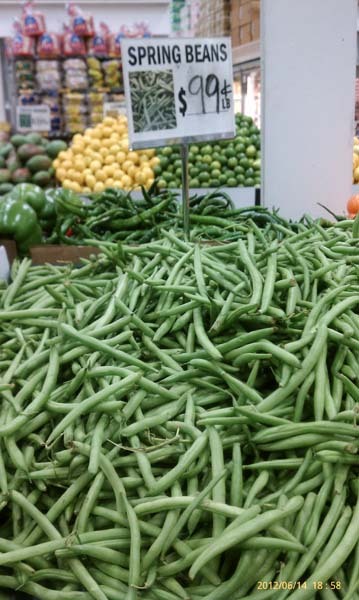 Wash and chop French Beans in 2" length. Heat Mustard Oil in a kadhai and fry 1 small onion thinly sliced. Follow with 5 clove of garlic chopped and 7-8 hot Indian green chili. Next add the beans, around 3-4 cups of the chopped ones. Add salt to taste. Saute the beans till it is soft and cooked. Once it has cooled down put the contents of the kadhai(beans+everything else) in a blender jar and add about 1/4th cup of grated coconut. With a splash of water make a thick paste. You need to dry up this paste now. So heat a teeny bit of Mustard Oil and add the west paste. Saute until you have dried up the excess water and the result is a moist bpaste. 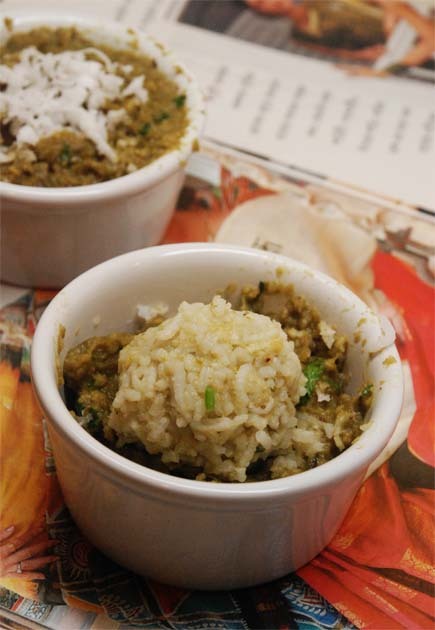 Add some finely chopped fresh coriander leaves and serve hot with fluffed up white rice. To eat with your fingers, mix little dollops of paste with rice and enjoy. For the non--veg version, you have to get some small to medium sized shrimp. The frozen ones work best as you will be making a paste out of them shrimps. Wash and clean shrimp(or just defrost). Then toss with little salt and pinch of turmeric powder. Heat some oil in a frying pan and fry the shrimp until it is soft and golden. When it has cooled down, put the shrimp in the blender along with the beans and make a paste. Now there are two things I wanted to share with you.A couple of months back I had the privilege to chat with Scott Haas -- an author of several published books, a James Beard award winner and former NPR producer. The whole thing was courtesy a dear blog reader. It was a cozy chat--almost like an adda and it got morphed into an interview at TOI. You can read it here if you wish. The second is , BS's summer vacation starts today and it goes on for 2 and half months. As a summer project for BS we decided to blog about the books she is going to read over the next two months. Every week she gets to pick 3-4 books of her choice while I pick 1 or 2 for her. Of these the ones that she really likes will be blogged about. Some books that LS likes might find its way there too. It is going to be a simple blog with no heavy review but just a way to list books she will read and hopefully love over summer. Also there will be some kid-friendly snacks that BS can make by herself. For this we have had great suggestions on Facebook and hopefully many of them will be done. 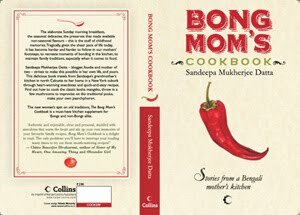 It will be nice to have you over there at Bong Mom's CookBook for Kids, with your suggestions and if your kid is starting summer vacation why don't you start a similar blog for them too ? This year I have had no time for any gardening. It saddens me for I love seeing things grow but then I have realized I need to prioritize instead of taking up too many things and then not doing any of them right or rather simply delegating. Yes, I love delegating and if it is the husband who is at the receiving end I can turn into a full tyrant nagger. Unfortunately the husband has had not much time himself and after cleaning up the weeds and planting three cabbage plants which BS lugged from school he has refused to take my orders. My family does not seem to understand the value I bring into their life. $#%$#%. And it does not stop at the other adult alone .My girls seem to follow the same route. The other day I was particularly mad about something and told them --" You do not listen to me, I am going to go away and be some other kids' Mommy". A statement which according to new age child psychologist would have scarred a child's formative mind and stunted their mental growth. Nothing like that happened. My girls were not even bothered. Instead the next day LittleSis comes and asks me, "Mommy, if you are going to be other kids' Mother, what is going to happen to their Mommy ? Are they going to have two Mommies? Won't their house get too crowded?" ! Nary a thought about her own Mother being gone was discussed. But not to worry. For I still have neighbors. I mean I cannot delegate my work to them or make them understand my billion dollar worth but I can borrow their Mint. And there is no dearth of it. Come summer their Mint bush grows and spills over and creates havoc as if she had Persephone's number on speed dial. They are only too happy if I snip off some. And no doubt that is what I do. For a couple of weeks, every Saturday or maybe even Sunday I have been making this chicken curry with mint, coriander and coconut.We are trying to eat more fish and vegetables and less meat these days. Definitely very less of mutton or any red meat. But at least two days a week it is chicken curry for us and more for LittleSis who is a big time meat fan. With this kind of a curry you need to make little else and along with a rice and salad it makes for a nice weekend lunch. 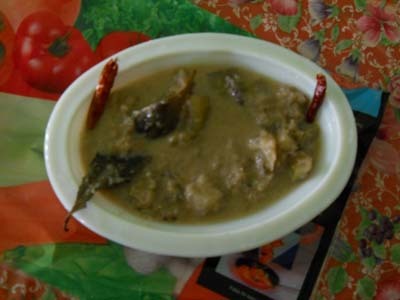 The idea of this curry came from Srivalli's(who blogs at Cooking for all Seasons) Mutton Semi Gravy or Mutton Gojju. That it was Andhra style nailed it for me. To it got added the mint-coriander masala paste I make for Pudina Dhania Chicken which was inspired by Aayis Recipes.Following Sri's idea I also added some coconut to the paste. The chicken curry was really very good.We all loved the gravy so much that I have made it several times now. Marinate 2lb of chicken with 2 tsp ginger-garlic paste, salt, turmeric powder and 2-3 tbsp of thick yogurt. With a splash of water make a smooth paste. Next Add 1 onion roughly chopped. Fry till onion turns soft and brown on the edges. Add the marinated chicken pieces and saute till chicken pieces lose their raw coloring and turns golden yellow with brown spots. Mix well and cook the chicken in the masala for 10-15 minutes. If any water is release from the chicken let it evaporate. Finally when you see oil seeping out at the edges add about a cup of warm water. Mix well and add salt to taste.A sprinkle of rock salt or beet noon enhances the taste. Also add 6 green chili slit if like me you had not added chili to the paste. 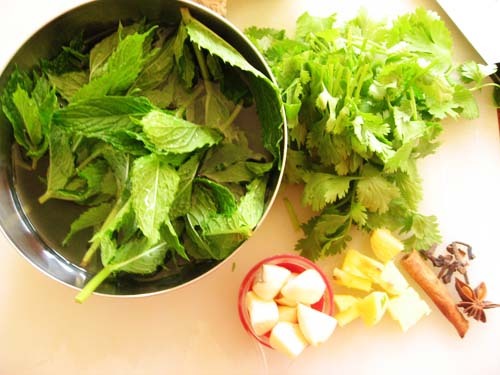 Add a few more mint leaves and cover and let the chicken cook You can do this step in the Pressure cooker too. Like 99.99% of middle class Indian Parents my parents have or at least had an unswerving faith in education. They also had an almost blind belief in the Indian education system and honestly in the late 70's when I started school it was not such a bad one. I mean yes it did not allow exploring or free thinking but it provided wholesome disciplined learning and that suited me fine. I was never the kind to drop out and start Facebook after all. My Mother never forced me to study in so many words, neither did she send me for tuition or spank me with a haatpakha if I refused to do homework. However it was somehow understood that the only thing I was expected to do reasonably well was study, academically and rank at least amongst the first three in class. I was one of those boring, obedient kind of child who would rather study school books than study the lifestyle of an ant and so the deal suited me fine. It probably helped that I also could read as many fictional novels under that pretext. To make it easier for me and also maybe because Ma stayed home and had some sort of help, very little was expected of me regarding household chores. Of course there were set things I did but nothing major and hardly anything in the kitchen. "Ekhon porashuno korar shomoy", she would insist that this was a time for studying. My Ma did not think cooking was something that needed to be taught early on. She believed it was a skill anyone could pick up when the time was right and according to her there was a lifetime left for me to learn those. In absence of Food Network and amidst drudgery of home-cooking she clearly did not put a lot of value to it. I guess she liked it given that she was always cooking one thing or the other, setting up 2 kinds of breakfast and a minimum of 4 dishes for dinner, experimenting and never delegating a meal to a cook. But what I mean is she never thought "cooking food at home" was an important thing. Nothing that demanded accolades, appraisals and a year end bonus. In those times phrases like "Cooking is therapeutic" or "Cooking brings me close to home" were not flung around freely.It was not really a choice, rather a necessity, something you did to feed family. There was no getting away from it. Period. If you loved it good for you, if not bad for the family. So I got away with cooking maggi in almost raw mustard oil at 12 and was heavily applauded by Baba for making a simple cup of tea at 13. Cooking was not expected of me. Food though was something I loved and was often chided for my finicky tastes. My kaku, uncle had once said that I should get married to a rich restauranteur because though I would never want to cook myself, I preferred to eat well and in my own terms. But as they say "Life comes a full circle" and there came a time in life when it was cooking that became worthy enough for me to spend a major chunk of my time and energy for. And wonder, wonder I even liked it. As my Ma had said it wasn't too hard to pick up either, if you kept an eager mind. When I first started my blog I don't think I even mentioned it to my parents. It was a minor thing. He..e..l..l..o it was about cooking. Home cooking at that. They would think "What was so great about it", I thought. But because I wrote about my daughter I gave my Dad the link to read up anecdotes about his granddaughter when they were thousand miles away. It was just one more means for connecting in the modern world. Soon they got hooked and they would now read the blog often, if not regularly. Baba would sit in front of his desktop later at night, the phone would be off the hook, the wire connected for dial-in and over a slow ethernet connection they would read whatever part of the blog decided to load. Okay, I might be romanticizing and he might actually be checking Facebook instead of reading my darn blog. My Ma would discuss recipes that I had blogged or could blog. She would sometimes cook something from the blog and tell me so. Of course 90% of the recipes there were hers so I am not sure why she would do that. Maybe to make me feel good or something. I would discuss some of the e-mails, readers sent, with them.Baba would share pics of the vegetable market he had taken with the blog in mind. But my Ma never wrote a recipe for the blog for the simple reason that she does not believe in boundaries of cups, teaspoons and tablespoons. 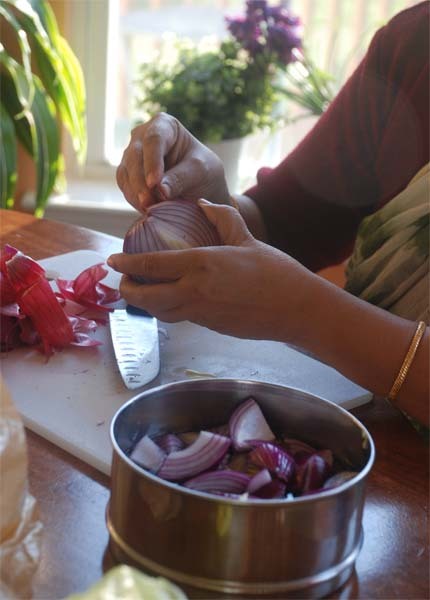 While cooking she never measures, always relying on her perfect sense of andaaz, her fingers trusted to pick up the right pinch. I mean which Indian home cook measures their ginger, and it was okay. If she told me ektu jire..I cooked it at home and replaced ektu with 1 tsp only if I was to blog. Else I too relied on my "pinch". A week or so back I told her that what with the work on the book and the impending summer vacation I don't get time to update the blog as often as I liked and it would be nice if she send me post ready recipes. "But I don't measure..like you", she panicked. "Err..well you could. It doesn't have to be precise to 3 digits after the decimal but anything to give an idea. ", I said. Yesterday, with a "ping" an e-mail landed in my mailbox. The subject said "Lau er Malaikari" -- Bottlegourd cooked in Coconut Milk. and the body had the recipe written in Bangla with the cinnamon measured to an inch. It was a recipe Ma had seen on TV and tried at home. There was a picture to boot. It was overwhelming to say the least. I have come a long way but so has my Mother. From "ektu Darchini" to Darchini -- 1", it has been a long walk. That single status on FB got more likes than even my Book announcement. Thank you so much for this and though I rarely say corny lines in public, Thank You Ma and yes you too Baba. 1. Lau/Bottlegourd -- dumo dumo kore kata/cubed 4 cups ( 24/ 25 cubes ). 2. Onion 1- paste kora. Add couple of green chili to this if you like it hot. 6. Ginger paste - 1 table spoon. 8. Red chili - 2. 13. Ghee -- 1 tsp to drizzle at the end. Prathame karai te sada tel ( oil ) debe, garam hole ote tejpata ,sukno lanka, garam masala phoron debe. Tarpore onion paste & sugar diye ektu fry korbe. Tarpore ote lau ta diye fry korbe, gas sim kore. Ebar ote salt diye dhaka ( lid ) diye dao. Lau sedhho ( boil ) hoe gele ote ginger paste diye debe.Ebar ektu nere niye ( stir ) ote coconut milk mix kore, abar ektu dhaka diye rakhbe. Tarpore ektu makha makha kore gas theke nabiye nebe. Opor theke ektu Ghee diye serve korbe. Next add onion paste and fry with a tsp of sugar. 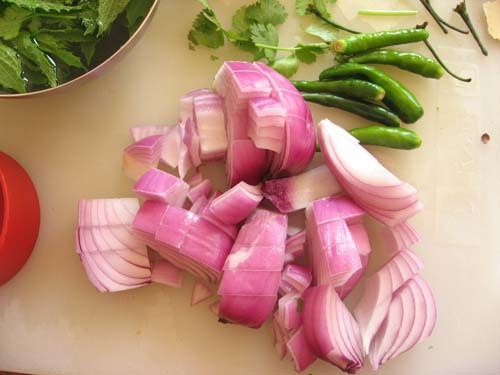 When there is no raw smell of onion add the cubed lau and saute at low heat. Add salt, cover and let the lau cook . Once the lau is done add the ginger paste and fry for a minute. Add the coconut milk and let the gravy simmer and come to a boil. The dish will have a clinging gravy and when that consistency is reached switch off heat. Drizzle little ghee on it and serve with rice. I think he meant "Love". Or maybe not. I am never sure of such stuff. Everytime I cook a lau--the lauki -- the bottlegourd, I think of that line and try to search for some deeper meaning. But he also went around saying "God is GodParmesh" which I THINK does not deliver any profound message. Or maybe does. 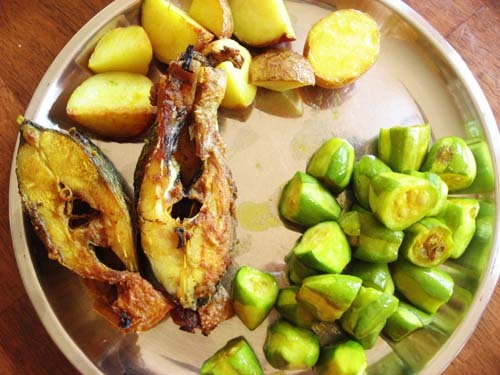 The bottlegourd---the one we call lau is a favorite summer vegetable for the bangali. 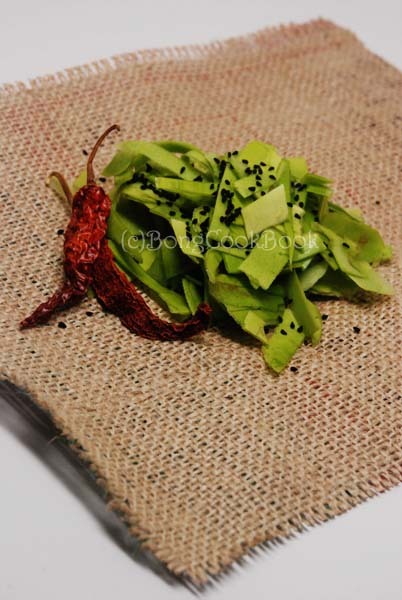 It is a beautiful shade of green that captures your senses in the baked brown heat of an Indian Summer. 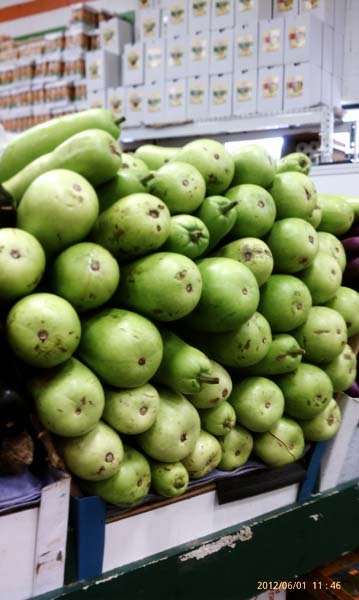 Top it with its cooling qualities and high water content,and you have a veggie that is brought back from the haat every other day along with two more favored summer veggies -- potol and jhinge. By the time the hottest summer is over Bengalis are only too glad to tuck away their lau recipes and look around for a fulkopi. Everytime my Ma made a Lau, she saved away the peel, the lau er khosha, to make a quick stir fry. She did a similar thing with potato skins. No points for guessing which I liked better. Friday on a whim I saved the lau er khosha -- the peel. It is not a regular feature. Mostly I am lazy and throw it away. This time I didn't. I did not chop it fine though as is the norm. I have little patience with such things. The kitchen Nazi husband was aghast. "Jhiri Jhiri kata hoy ni! ", he bemoaned. The peels are not julienned being the essence. I ignored and posted the pic of the bottle gourd peels which were not "jhiri-jhiri" on my FB blog page. Well it turned out 99% of Bengalis were as aghast as the kitchen Nazi husband. Most of my blog readers are very polite and so they protested only meekly. 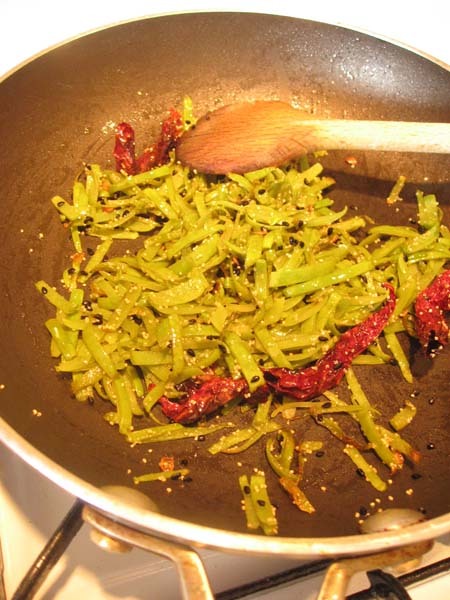 I stir fried my un-jhirijhiri peels with kalonji and dry red chili. They tasted fine enough. The next morning the husband who was obviously itching to get the peels done right got hold of another bottlegourd. 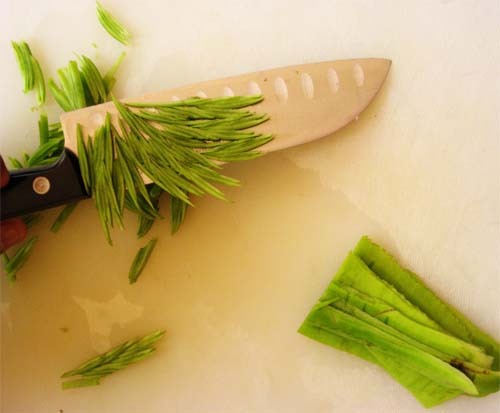 He peeled strips of the pale green peel in three-quarter of an inch width and piled them high. Then he chopped them fine along the width -- jhiri jhiri. Everyone breathed relief. I made the stir fry again. It tasted the same. I guess if the skin or peel is a tough one the fine cut is necessary else the peel might burn before it gets fully cooked. In this case the peel was soft and tender and both ways worked. But I dare not tell a Bong that. If it is Lau er Khosha -- they want it jhiri jhiri. Peel the skin of a bottlegourd. Chop it in julienne. There will very little peel from a single gourd, I had only 1/4 cup of it. Wash it well. Now toss it with little salt and turmeric powder. Keep aside for 10 mins. Drain any excess water from the peels and add it to above. Now saute the peel at medium high heat. Sprinkle water as needed. Add sugar and salt to taste. Go easy on the salt as you added some earlier. Sprinkle some poppy seeds on top and cook till the skin has softened and is cooked.The poppy seed is optional.